IDF deploys missile defense system, fearing rocket attacks from Gaza over hunger striking terrorist Mohammed Allan. 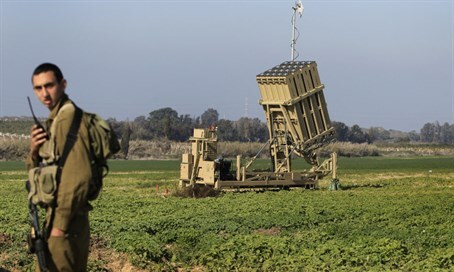 The IDF has deployed the Iron Dome missile-defense system to the southern city of Ashdod, over fears Islamist terrorists in Gaza could launch rocket attacks if Islamic Jihad hunger striker Mohammed Allan dies. Allan's condition deteriorated Wednesday after more than 60 days of hunger striking. Doctors have said he is suffering from brain damage, although the extent is not yet clear. As a result, the Supreme Court temporary lifted Allan's administrative detention order - which he had been protesting - drawing criticism from some legislators, who accused the court of capitulating. Allan then agreed to end his hunger strike, but officials are still concerned that Islamic Jihad could use any further deterioration in his condition as a pretext to attack Israeli civilians. Islamic Jihad - the second-largest terrorist group in Gaza, after Hamas - has explicitly warned it will break the ceasefire with Israel and launch attacks if Allan dies.